Earl Stanley sits in the living room of his Metairie home, flanked by two splashy movie posters starring the East Side Kids and Cesar Romero. On the coffee table in front of him is a photo album more than half a foot thick, populated by musical compatriots at least as fascinating as any black and white star of the silver screen. There are snapshots of Earl on Rampart Street in the late '50s dressed to the nines in two-tone shoes and pachuco-styled trousers, a picture of his first band the Nighthawks with "Nighthawks For Music" stenciled crudely on a homemade amplifier and shots of most everyone he's ever played with from Mac Rebennack and Charlie Miller to Li'l Joe Lambert and Louis "Lump Lump" Meyers. Photos of his own band, Earl Stanley and the Stereos — who masqueraded as Roger and the Gypsies on the 1965 proto-funk garage classic "Pass The Hatchet" — finds them decked out in shades and two-tone Nehru jackets leaning against the continental kit of a jet black 1947 Lincoln. "I wish I had that car now," says Stanley, "It'd be worth a hundred thousand dollars. I bought it for fifty bucks! It was so big I couldn't turn the corner without backing up, it had twelve cylinders." He cues up one of his many unreleased recordings, a raunchy 1970 instrumental entitled "Ninth Ward Rumble" in tribute to guitar mauler Link Wray, then plays four remarkable blue-eyed R&B tracks by Art Sir Van that remain unreleased. He follows that with a 1957 live Spades performance that finds him raining blue notes from his guitar behind singer Bat Carroll at a C.Y.O Dance. With all due respect to Fats Domino, whose "You Know I Miss You" they're covering, the white boys are blowing him away. "I don't even know what I was doing," he says with deprecating humor. "I was only seventeen years old." hit "Gypsy Woman Told Me" is a prime example. "I made records where I had each guy playing note-for-note — 'I want it exactly like this' — and they never made nothing. But 'Gypsy Woman,' I was playing organ and I didn't know how to play it; I was just learning. That's why it's so simple, because I only knew one or two things. Maybe that's for the best. If I'd have been real good and cluttered it all up with junk, it wouldn't sound the same." By the time he cut "Gypsy Woman" in 1964, Stanley was no stranger to the recording studio, having waxed hundreds of discs with the Loafers and the Skyliners that serve as a connect-the-dots treasure map to the greasiest of New Orleans rock 'n' roll. With Mac Rebennack on guitar and piano, Leonard James on saxophone and Paul Staehle on drums, Stanley's electric bass lines drove the records that — when you peel back the veneer of national hits — defined the soul of the city in the late '50s and early '60s, from Morgus and the Ghouls' "Morgus The Magnificent" and Roland Stone's "Just A Moment" to Bobby Lonero's "Little Bit" and Jimmy Donley's "Think It Over." 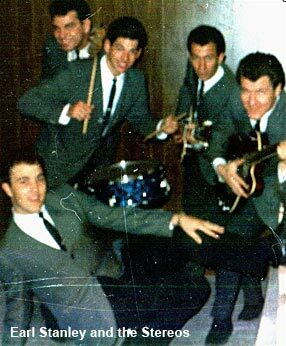 Stanley formed the Stereos in the early '60s, penning "Gypsy Woman" with his boyhood friend Mickey Tardo. "I didn't have a penny so Cosimo [Matassa] worked a deal with me; I gave him the publishing and he gave me the studio. [Vocalist] Whitney Roussell didn't show up to sing and I happened to remember Eddie so I called him up and he said, 'Yeah, I'll be there.' He came right down, learned the song right there and that's when we started working together." By 1965, Stanley was playing Papa Joe's on Bourbon Street in a legendary combo that included a young Skip Easterling on organ, Johnny Pennino on sax, Li'l Joe Lambert on drums and a yet-to-be famous Freddy Fender on bass. Joe Barry sang, while guitarist Joey Long drove the audience into a frenzy by laying his instrument down and conjuring feedback as if it was a genie in a lamp. The gig started at four in the morning and often didn't end 'til well after twelve noon the next day. Meanwhile, the Stereos were in full swing, and relatively unaffected by the British Invasion because, unlike many New Orleans musicians, Stanley loved the Beatles and the Stones as much as he loved rhythm and blues. He sported Cuban-heeled boots, played a Gretsch guitar and possessed a genuine mop top shaggier than that of many English rock 'n' rollers. On the recording front, he and his partner Ray Theriot had opened Thunder Recording Company on St. Claude Avenue, where, for $300 including pressing fees, anyone with a little talent could walk in off the street and make a record with the very band that had backed Powers on "Gypsy Woman." And it was worth a shot, because "Gypsy Woman" had knocked the Beatles out of the number one spot locally and gone to number three in New York City. "Our whole motto was do enough stuff and something will happen," Stanley says. "Because if you do nothing, nothing's gonna happen. So make as many records as you can; good, bad or indifferent; it don't matter as long as you own 'em." Thunder's prolific throw-it-at-the-wall approach created a fascinating cross section of primitive soul, R&B and Latino rock by the likes of Lenny McDaniel and the New Era, Micky and the Failures and Hector and the Eastmen, all of whom were actually the Stereos fronted by a rotating cast of band members and friends. The group reserved its own name for Stanley's guitar instrumentals and Powers' vocal numbers. One day, Stanley's cousin Roger Leon stopped by. Roger barely even played guitar, but he'd come up with the only requirement necessary: a cool riff. He even had a title for his song-to-be: "Pass The Hatchet." Stanley worked out a basic arrangement and the Stereos laid it down in the time left at the end of their next session. Joe Banashak at Seven B Records licensed it, ingeniously engaging Eddie Bo to whoop and holler over the track. The end result was one of the most hypnotic songs in all of New Orleans music, its wicked maraca shaking, compelling parade beat rhythms and crazed demands of "Let me chop it!" conjuring an intangible mystique. "We didn't think nothing of it," laughs Stanley, pointing out that the Beatles captured his own imagination in a similar way. "I thought it was a joke 'cause we were just making it up in the studio. Li'l Joe came up with the beat, Nicky Bodine came up with the bass riff, Art Sir Van played the piano, Hector Nieves played the maracas, Roger played a little rhythm guitar. We just put it together and recorded it on the spot." "Of all the producing that I ever did, the one I took the least interest in was 'Pass The Hatchet,' and that's the one that made me all the money. So you've just gotta keep making 'em. It's like playing a lottery." "I don't think we ever struggled," says Stanley of his self-made career. "We just had fun. I never did work in my life 'cause I do what I like. You do what you like, you never work."